The current sit-out happen between sit-outs and the last table. Eg. If there are 3 sit-outs, the 2nd 3rd and 4th players of the last table will sit-out for the following game. Instead of only having the players sit out from last table, players from last up to 3 tables will sit-out i.e number of sitout will be distributed equally with tie breaker being the lower table having 1 more sit-out. This will be done without affecting much of the ladder system. Below is an illustration for 3 tables and 3 sit-outs. After game 1, all players who get last (4, 8, 12) from these 3 tables will sit-out. Those sit-out during game 1 will join the table starting from the last table. 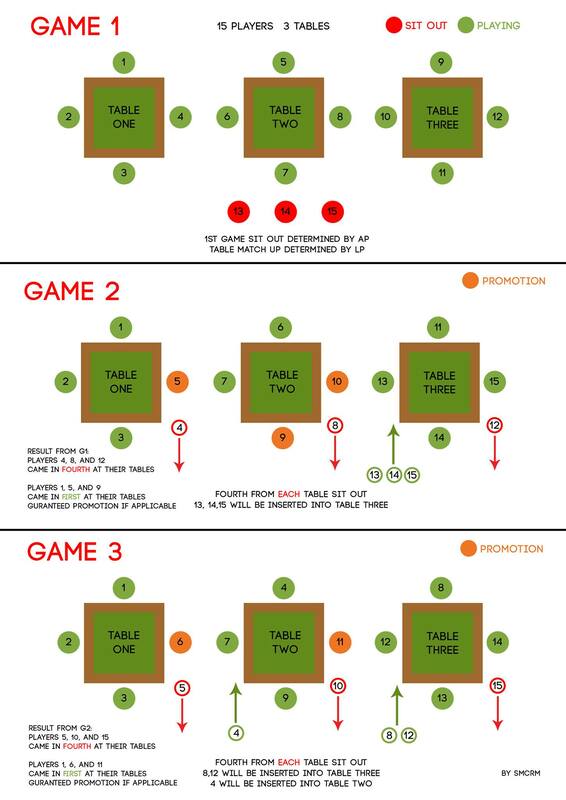 Player 9 and 10 will be promoted to table 2 and player 5 will be promoted to table 1 for game 2. After game 2, the same thing happen as of game 1. BUT here comes a different arrangement. After deciding the sit-out for game 3, the sit-out from game 2 will first return to their original table PLUS 1 (except last table cannot plus anymore). This means player 4 joins table 2, player 8 and 12 join table 3. Then we apply the ladder promotion procedure, leading to player 6 promote to table 1 and player 11 promote to table 2. So we can now assume that most of the time, the table you are playing at will have 1 sit-out. Cases of 2 sit-out per table only happens in two cases – 1 tables/2 tables with 3 sit-outs. As most know, these are usually a very rare scenario. Able to reach a higher table still has its advantage because the lower table will always handle the sit-out first. Some people might be thinking into coming up with a way to excuse any player from sitting out twice in a session because this new procedure still will have such cases. The chance of this happening is additionally made slimmer with the new procedure but it should not be entirely removed. When players are promised to have 2 games in every session, it becomes unfair to those who turn up on time yet spend a longer time to play 2 games (game 1+ game 3). In addition, it can induce more risk-taking play style which imbalance the game between players who might sit-out and players who know they will never sit-out. If anyone has any question or find any flaw in terms of creating more unfairness among players, do voice it out (at facebook group).